The French public sector went on strike on Tuesday. French unions CGT, FO, FSU as well as student unions UNEF and UNL had called for an "inter-professional strike" to present their demands on higher salaries, pensions and more generally on the cost of living. Several thousand marched in Paris, from the boulevard Saint-Michel to the Champ-de-Mars, as well as in other French cities. There were 17.500 protesters in Paris according to a media tally, but 50,000 according to the CGT union. Unions hoped that this strike would "amplify the social movement" in France in the wake of the Gilets Jaunes (Yellow Vests), to demand better living and working conditions and to defend the public sector. It is also protest against a public sector reform which is expected to cut 120,000 jobs by 2022 while moving towards a system of shorter contracts and remuneration based on merit. A poll by Odexa for France Inter found that 73% of the French people support the public sector strike. About a quarter (24%) of French teachers were on strike, the Education ministry announced at midday. The unions had estimated a slightly higher figure, hoping for 4 out of 10 school teachers to strike. French teachers have been mobilised since late 2018 against Macron's Education minister, Jean-Michel Blanquer. His education reform, they say, will worsen their working conditions, with more children in classes and less budget in schools. 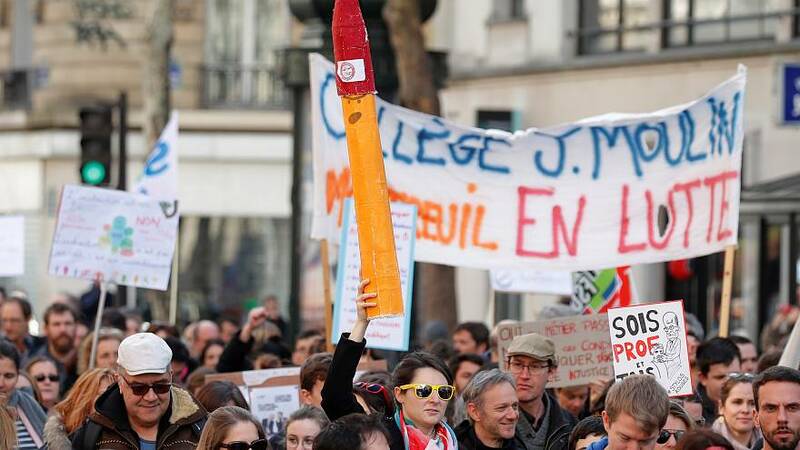 Their movement is called the "Stylos Rouges" ("Red Pens"), a reference to the Gilets Jaunes and to the red pen teachers use to mark students' essays. In previous actions, some teachers gave full marks to every student in their classes as a protest. Marches took place in Paris and across France, including in Lille, Toulouse, Nantes, Montpellier, Dijon, Poitiers, Rouen, and Epinal.